MetaSlider’s bringing out new slider themes – and they’re completely free! Metaslider’s good, but we’ve always seen its potential to give you so much more. For the past few months, we’ve been working hard to develop a stunning new feature: professional slider themes. One click, and they will completely transform the look and feel of your images, so that they really stand out! Choose from the themes that best match your website design. MetaSlider will launch with around 10 new themes, but will be continuously adding more with each new release! Once you’ve chosen a theme, you can prereview your slideshow directly from the theme viewer. 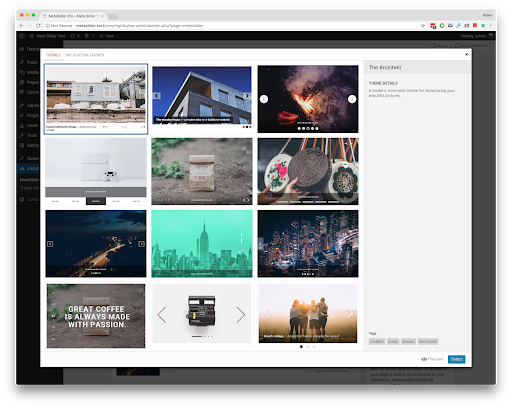 Advanced users can programmatically apply a theme to their slideshows. This is an example of ‘The Architekt’, just one of the brilliant new themes that will soon be launched on Metaslider. It’s clean, modern and minimalist, a great way to show off images on your website. We always love to hear from you; please use the comments section below to let us know what kind of style and themes you would like to see in the future. These slider themes are scheduled for release this September. Be sure to visit UpdraftPlus and MetaSlider for further updates and information about MetaSlider. The post MetaSlider’s bringing out new slider themes – and they’re completely free! appeared first on UpdraftPlus. UpdraftPlus – Backup, restore and migration plugin for WordPress.